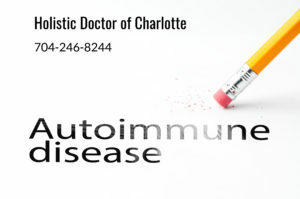 What is Autoimmune Disease & Do I have an Autoimmune disorder? What does Autoimmune mean? It is any disease caused by the breakdown of self-tolerance, a highly inappropriate immune response followed by severe systemic inflammation. What this means is the body can no longer differentiate between a foreign substance or intruder and the normal organs or tissues of the body; so it mistakes certain types of normal organs/tissues in an autoimmune patient for invaders, a harmful substance and turns the organs/tissues into antibodies which then fight against the organ/tissue. There is often a genetic component, but whether these genes get expressed or “turned on” usually depends on a myriad of other factors such as heavy metal toxicity, microbial infections, EBV and other herpes family of viruses, gluten intolerance and foods that cross-react with gluten and mimic its destructive effects. This is just a short list of the possible triggers that can cause autoimmune disease. Frequent infections with slow recovery. Food allergy and food lectin sensitivity using AllerCease™. NES full body bioenegetic scan. Testing of blood, urine, saliva & hormones to determine whether immune system is rejecting bodily fluids and secretions using AllerCease™. Other highly specialized lab tests, as needed. I know how overwhelming and scary a diagnosis of autoimmune disease can be, especially when the conventional pharmaceutical approaches have so many serious side effects. That is why I am prepared to leave no stone unturned to get to the bottom of a patients clinic diagnosis and symptoms as accurately and safely as possible. The following drugs are commonly used as immune suppressant in severe autoimmune disease cases. There are very real & sometimes life threatening risks associated with these drugs. Doctors, no matter how well trained and well-intentioned, are playing Russian roulette with their patients lives by prescribing these toxic drugs. The drugs significantly increases the likelihood of cancer, premature aging and tissue breakdown. They ignore the proven effectiveness of nutritional and holistic therapies which at the very least, should be used in tandem with the pharmaceutical approach. Should I rely on Immune Suppressive Drugs? I strongly suggest that all autoimmune disease patients should not rely solely on immune suppressive drugs and the next “breakthrough pharmaceutical miracle”. It would be wise to look for alternatives with a more natural approach that focuses on getting to the root of their autoimmune disease condition and uses proven natural procedures and remedies to enhance and support the immune system.